Ah, yes, Deanna, I love TED talks, too! And this is quite a fine homage to all that’s great about them! Well done, my friend! Kinda loving this one tonight! Very powerful to pull all these souls together. I have also really enjoyed the Age of Persuasion…info and the guy’s voice. I am going to try and figure out podcasting…I have to clean the basement! It’s super easy to download – and if you can’t figure it out, Peter or Julia will show you! Thank You So Much! I have never listened to a pod cast. Now I am not only going to listen to one, but create one to showcase my book and invention. How long are they generally? (book is about some of the most common tools we have available to manage our personal power/energy and the invention is “the easy way to Feng-Shui). I am excited to get such a useful piece of info this morning!!! It is almost as good as sunshine (which we need but it is raining here agian-Indiana). 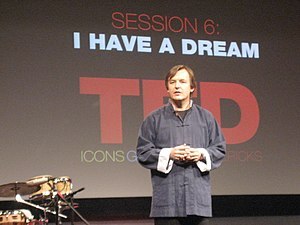 My favourite TED talks (and they are all awesome!) is Elizabeth Gilbert’s talk about separating the artist and the muse. So powerful, and she is such an entertaining speaker! Thanks – I am downloading it, love her candidness.